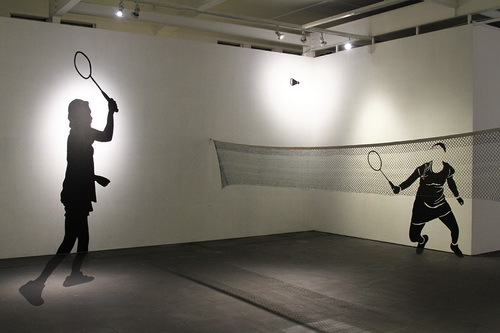 Tinuku ~ Galeria Fatahillah have presented installation artworks by Anang Saptoto titled "Games of the New Emerging Forces" during a joint exhibition titled "Dialogue with the Senses", October 21 to 3 November 2016 in Jakarta. Galeria Fatahillah presents a series of installation art by favorite artist based in Bantul, Yogyakarta, Anang Saptoto which took place October 21 to November 3, 2016 in Jakarta. 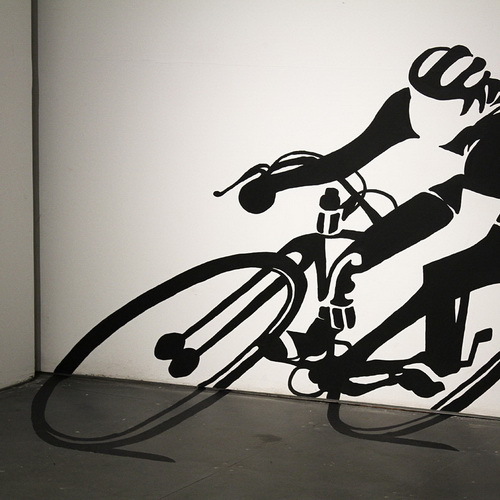 The exhibition also displays works by Ricky Janitra a.k.a Baybay, Fajar Abadi RDP, Elijah Nurvista and Heri Dono. 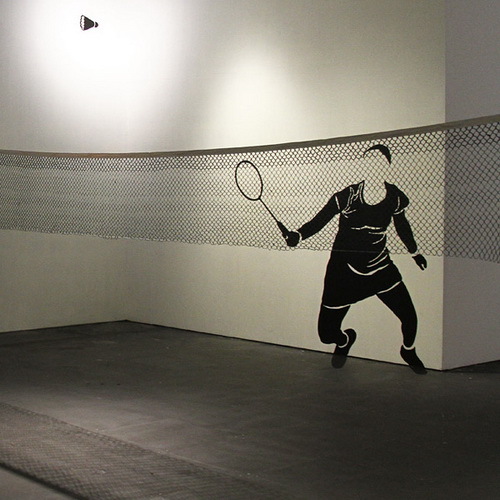 Two works by Saptoto titled "Games of the New Emerging Forces" presents black silhouette graphic art to indicate the activity of cycling and badminton athletes along with a net installed transversely. Both works painted in the corner of the room but it was as though standing in three dimensions. Saptoto artworks more presents compilation of graphic, photography, video, murals and composition of three-dimensional objects that are packaged as installation and performance art works were placed in a room in variety of conditions, situation, position and size. 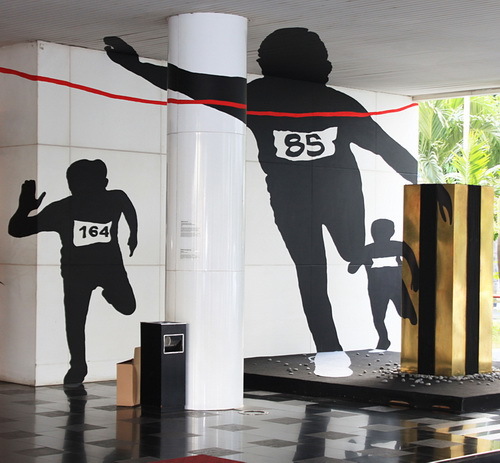 The work titled "The Fastest Sprinter of Asia (Mohammad Sarengat, 1962)" is the mural in 2013 that describe black silhouettes of sprint athletes in the seconds before the finish line. 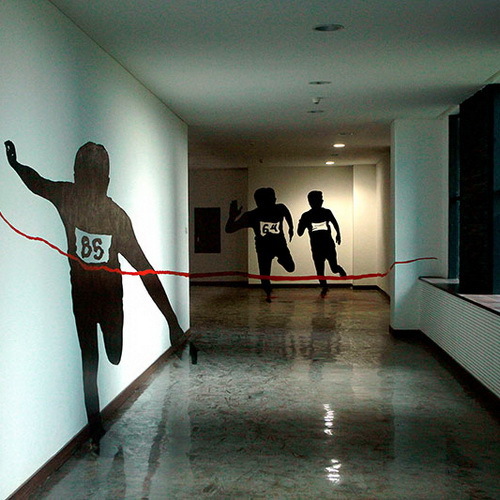 An athlete numbered 85 touches the tape made visible red paint the most conspicuous. "Size is the approach I use in creating work, both photographic and video for two years. In the early stages of work, I take measurements of the objects that I found, I selected because it has social relationship, then I photograph," said Saptoto. "I manage the set for analysis to determine the experimental area and expectations of the work that I want to create. For me, size is not something absolute because the object must be able to relate to material and situations where established," said Saptoto. "In the realm of ideas, the size of the values underlying memory, even comparable to the image. 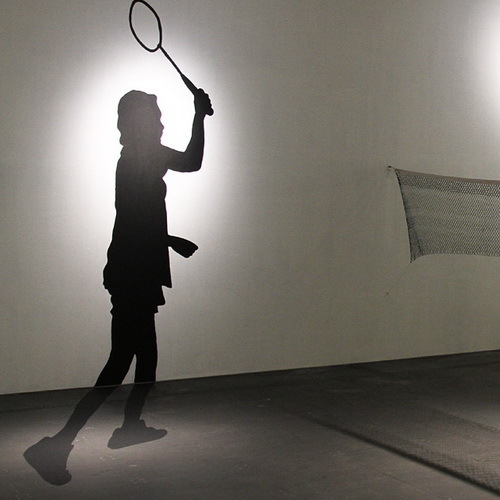 Memories that lead us to the meaning of an object and situation," said Saptoto. "In work, I take advantage of the values in the memories and sensations that arise from any real size, so did the placement. This I did because I wanted to bring a pause between objects with social relations, which is then understood as awareness of the situation and the broader issues," said Saptoto. In 2009, Saptoto establish Minimi Studio, an active member of the MES 56 and has had internships with Greenmapper Jogja and Jogja Heritage Society, as well as working as facilitator for Plan International and Save the Children.